The Naval Academy Band blog is back by popular demand! We've been busy here at the band, and have taken a hiatus from the blog, but our throngs of followers have expressed their disappointment with our lack of updates, so we will do our best to stay current in 2013! 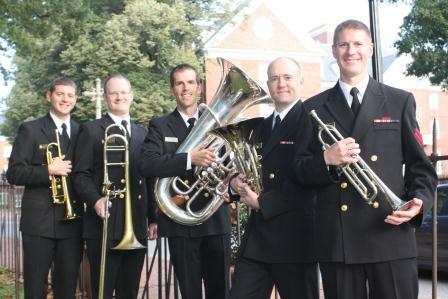 Last weekend, the USNA Band's Brass Quintet "Gold" performed at the inaugural Carolina Trumpet Fest at the University of North Carolina, Greensboro. Our group is lucky in that we have a great time together, which made the five and a half hour drive to Greensboro quite fun. After checking into the hotel, we relaxed in the hotel to unwind from the drive before heading out on the town. We found a popular restaurant with a local flair, and its famous appetizer, "Fire in the Hole" was a delicious wing dish that we will not soon forget. The week had been busy as we were preparing, not only for our Brass Quintet performance at UNCG, but also for an upcoming performance at the Georgetown Jazz Festival with the Next Wave Jazz Ensemble and a Wind Ensemble concert which took place the previous evening. Therefore, Friday night was a good time for us to decompress from the week and prepare for our performance the next day. Our performance was at 9 am Saturday morning so we were up and out early. UNCG has a beautiful School of Music and it was buzzing that morning with Carolina Trumpet Fest attendees. The other invited guest artists for the festival were Kevin Finamore, second trumpet in the Dallas Symphony, and Chuck Lazarus, renowned soloist and trumpet player with the Minnesota Orchestra. Our performance included monumental works by composers David Sampson, Ralph Vaughn Williams and Anthony DiLorenzo as well as music from members of our group. We opened the concert with the world premiere of MU1 Chris Buchanan's "USNABQ Opener" and also played arrangements by both MU1 Buchanan and MU1 Clint Woltering. MU1 Buchanan arranged Suite no. 7 from Johann Hermann Schein's Banchetto Musicale and MU1 Woltering arranged the third movement of Paul Hindemith's Symphonic Metamorphosis. It is so nice to be a part of an organization with such talented musicians! During the recital we opened up the floor to questions. The attendees were interested to hear about the Naval Academy and the Naval Academy Band. After the recital, we talked to many of them about the USNA, USNA Band, and the Navy Music Program, while handing out outreach materials and recent recordings of the band. Unfortunately we had to head back to Annapolis that day....a short and sweet trip. We are fortunate to share our music and experience with aspiring musicians. Thus began the spring for BQ "Gold". Stay tuned to hear about our upcoming adventures, including our upcoming performance at the University of Kentucky Brass Fest in March! The United States Naval Academy is not responsible for the content found on this site. In addition, the content of this site does not necessarily reflect the opinions, standards, policy, or endorsement of the Naval Academy or the United States Government.